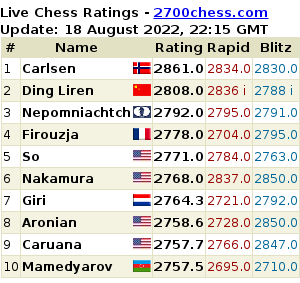 In the table below you can see which grandmaster will play in which tournament. Any changes, which may happen before the end of the series, will be noted in it. The announcement also states that the start of the London stage was moved by one day: the first round will be played on 21 September; the start of the Lisbon stage was moved by one week and is planned for 17 April next year. FIDE website published an official announcement according to which the 3rd stage of the Grand Prix will take place in Zug, Switzerland as scheduled from April 17th to May 1st. The opening ceremony of the first stage of the FIDE Grand Prix 2012/2013 will be held tomorrow in London. We reported on changes in the participants' list in early August: Namely, Sergey Karjakin had to be replaced by Peter Svidler, however, today we got to know that the winner of the World Cup is not able to participate in the 1st stage. Michael Adams will play instead of Svidler. It seems that GM Vugar Gashimov won't play in the current Grand Prix Series due to health issues. 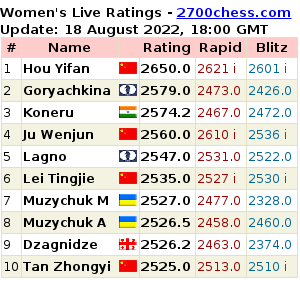 The Azerbaijani GM is no longer in the updated participants' list published on the FIDE website.